This is FRESH AIR. 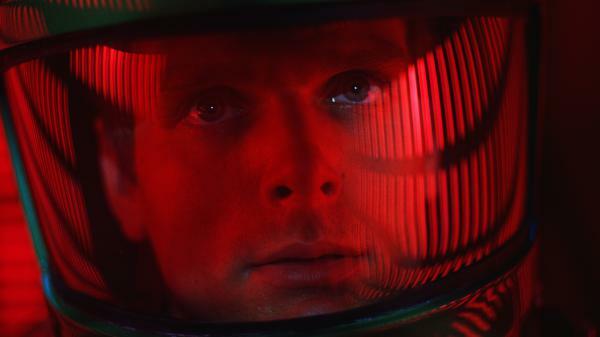 This week marks the 50th anniversary of the premiere of the film "2001: A Space Odyssey." It was directed by Stanley Kubrick, who died in 1999. He made many well-known movies, including "Dr. Strangelove," "A Clockwork Orange" and "The Shining." Our critic-at-large John Powers says "2001: A Space Odyssey" is both one of a kind and an expression of its time. JOHN POWERS, BYLINE: Near the beginning of Stanley Kubrick's "2001: A Space Odyssey," a big, black monolith appears in the African desert, leaving a group of prehistoric ape men standing there baffled. That was pretty much the reaction that greeted the film itself when it premiered 50 years ago this week. Nobody was quite sure what to make of it. The critics were harsh, with Variety dismissively saying, "2001" is not a cinematic landmark. It's hard to imagine being more wrong. You see, even if you don't like the movie - and I don't particularly - the one thing that's undeniable is that it's a cinematic landmark. Not only was it the No. 1 box office movie in 1968 - young people flocked to it to have their minds blown - but in international polls, "2001" routinely ranks as one of the top 10 films of all time. An avant-garde art film dressed in Hollywood money, it unknowingly foreshadowed the future of movies as effects-driven blockbusters. I saw it again a few days ago, inspired by Michael Benson's terrific new book "Space Odyssey: Stanley Kubrick, Arthur C. Clarke, And The Making Of A Masterpiece." Though Benson is afflicted with what a friend calls the Stanley syndrome, he never stops telling you that Kubrick is a genius and a perfectionist. His book is filled with nifty stories. My favorite is when the control freak director asks Lloyd's of London if they could insure him in case NASA spoiled "2001's" plot by discovering extraterrestrial life before the movie came out. Watching "2001" again, I was startled anew that in nearly 2 1/2 hours, there's so little dialogue or dramatic storytelling. The characters barely register. Rather, in an attempt to make what Kubrick called a really good science fiction movie, not something hokey, he and co-writer Clarke thought big - visionary big. They concocted nothing less than a poetic myth of human evolution, a vaulting ambition announced by the music we just heard from Richard Strauss's "Thus Spake Zarathustra," which everyone knows largely because of this movie. Clarke and Kubrick carry us from the origins of human beings in those desert apes to the climactic birth of an advanced new life-form - a star baby engendered by extraterrestrials. In between, we follow two astronauts played by Keir Dullea and Gary Lockwood, whose journey to Jupiter runs afoul of their ship's supposedly infallible computer known as HAL, the prototype of countless movie computers to follow. Here, Dullea's character Dave learns that there may be a sinister side to HAL's artificial intelligence. KEIR DULLEA: (As Dave Bowman) Open the pod bay doors, HAL. DOUGLAS RAIN: (As HAL-9000) I'm sorry, Dave. I'm afraid I can't do that. DULLEA: (As Dave Bowman) What's the problem? RAIN: (As HAL-9000) I think you know what the problem is just as well as I do. DULLEA: (As Dave Bowman) What are you talking about, HAL? RAIN: (As HAL-9000) This mission is too important for me to allow you to jeopardize it. DULLEA: (As Dave Bowman) I don't know what you're talking about, HAL. RAIN: (As HAL-9000) I know that you and Frank were planning to disconnect me, and I'm afraid that's something I cannot allow to happen. POWERS: Now, like many classics, "2001" isn't always a good movie. Some bits are boring or superfluous, and Kubrick was clearly more fascinated with the film's slickly designed spaceships than its ideas about human evolution, which are thin and arbitrary. Yet the movie's carried by images you'll never forget - the monolith, the space stations waltzing to Johann Strauss' "The Blue Danube" and the long star gate sequence, a hurricane of lights and images that were once thought trippy. Its effects were all the more amazing because Kubrick had to pull them off without CGI. His example inspired later directors, who felt that he had both upped the technical ante and made science fiction films respectable. They genuflected before Kubrick's courage in refusing to tell a conventional story, though, of course, they themselves never dared to do that in their own science fiction films, like "Star Wars," "E.T.," "Blade Runner" and "Avatar." The movie tapped into a key aspect of the '60s - the countercultural belief in expanding consciousness. Though Kubrick was vehemently not a drug user, he wanted "2001" to open the doors of perception, to show us a higher level of being. That dream seems like something out of the past in these days of shrinking consciousness filled with fake news and the hatred of science. Indeed, watching "2001: A Space Odyssey" now is like opening a time capsule. And it can bring on a melancholy nostalgia for the era that spawned it, an optimistic time when Walt Disney created Tomorrowland and Americans believed the future was limitless. The Kennedy-esque confidence that we had the strength and ambition to travel the cosmos seems long gone in this era when even getting our roads repaired feels impossible. GROSS: John Powers writes about film and TV for Vogue and Vogue.com. Tomorrow on FRESH AIR, my guest will be Mark Oliver Everett. His band Eels has a new album, his first after a four-year hiatus from music. Many of his songs are about depression, including songs about his sister, who took her life. A 2007 documentary was about his search to learn about his late father, Hugh Everett, the now-famous physicist who came up with the theory of parallel universes. Eels record "Fresh Blood" was the theme for the HBO series "The Jinx." Lots to talk about - I hope you'll join us. RAIN: (As HAL-9000) Look, Dave, I can see you're really upset about this. I honestly think you want to sit down calmly, take a stress pill and think things over. Dave, stop. Stop, will you? Stop, Dave. Transcript provided by NPR, Copyright NPR.